If I told you there is something you could do that doubles your chance of beating cancer, would you do it? You would? Much has been written about the benefits of exercise and we all know that we should be moving more. But what if you’ve been given a strong dose of chemotherapy and/or radiation, surely this is not the time to be talking about exercise? Well, researchers at the Exercise Medicine Research Unit in Australia have been conducting small scale experiments on their patients in the Cancer Care Unit. Initially, they observed that many patients were too weak to fight the disease, but they found that those patients who did exercise regularly experienced less side effects of the drugs. They also found that exercising during treatment helped muscle mass loss, which is usually around 10-15%. Here, it is interesting to note that Professor Robert Newton, director of the institute, reports that so far, there is no pharmaceutical intervention that can prevent muscle loss. During exercise, blood flow increases to the muscles and, in turn, produce chemicals throughout the body that destroy cancer cells. He found that the body appears to develop its own chemotherapy that kills the cancer cells. However, not all exercise is created equally. Their oncologists and physiologists design carefully tailor-made exercise programmes for each individual according to their type of cancer diagnosis. Some did their exercise programmes on chemo days, others in between their chemo days. Some were allotted certain types of resistance training, whilst others were prescribed plyometric type of movement, otherwise known as impact training, or cardiovascular exercise. The patients reported that the more exercise they did, the better they felt. The results of one study in Denmark were so profound that it led to changes in the national guidelines for cancer treatment in the United States and Australia for prostate cancer treatment. This is incredible! As it’s very important to know which exercise to prescribe for each cancer treatment, they strongly recommend seeking specialist medical advice from those who have expertise in prescribing exercise for cancer care. Exercise prescription has come a long way since I was worked in the industry. In the meantime, why wait for a diagnosis? Prevention is better than cure and we can all do with moving a little more throughout the day. So, what are you waiting for? Spring is in the air, so now is a great time to get started by increasing the amount of walking you do. Whether you go for that walk in the woods, or along the beach, your body is building up its defence mechanisms, slowly but surely. Karen Thorne, The Conscious Eater, Eating Psychology Coach and Rapid Transformational Therapist. As we come near the end of the first quarter of 2017, it gives us another good opportunity to reflect back on our desires for the year and to match up how we’ve done so far. So have you achieved the things you wanted so far? Here’s a little run down of how to create the life of your dreams this year. 2. Get clear on your top 5 desires. An easy way to do this is to put the opposite of what you put in the previous list. For example if you say I don’t want to life in a miniscule box room, you can set out your desire for a large comfortable space with high ceilings. That’s what I did and I got it. 3. Create a vision in your head of what your desires look like. You can set out pictures from magazines on a piece of paper or pin board creating a collage of images representing what you want to create in your life. The process itself is really fun and on your board you can divide the space up into areas of your life, relationships, spirituality, social life, family, living space, travel to name but a few examples. ​5. Finally, you’re tuned in your turned on 100% to the new possibility. You’re excited, you’re empowered. You’re passionate. Now from that place of inspiration and passion it’s time to take the action. Not just any helter-skelter actions, but aligned actions. Actions that are lined up with your energy and that of the vision you’re trying to create. These actions should feel good and inspired. They may be a little scary at times, but that’s actually a good sign. That’s it. That’ the basic run down of how to make your dreams a reality. The truth is, we are all unconsciously creating our reality anyway, so how about if we could make this creation process conscious so we can create a life we desire, the life we want and the life that inspires us and others. Go on … I dare you. Are you ready to make some changes in your life? Hello. I am Heather Day and I am a life and business coach. I am also trained in energy psychology and I joined Holistic London last April. I decided that my first blog post needs to be about the process of making changes in our lives: big and small. Often the first step is to step back and consider what is not working well in your life at the moment. Can you name it and identify what needs to change? Then, ask yourself where you would like to be. What will it be like when you get there? How will you be feeling/thinking/being. In order to make any changes you will need to set some goals for yourself (or some people prefer to call them intentions.) If you can’t define any goals nothing will happen and another week/month/year will go by without any movement. As you read this, you may already may have a goal in mind. Great, but have you broken your goal down into small, achievable steps? You will need to decide on some daily actions to enable you to move forward incrementally. You may have heard of this expression “If you keep on doing the same things then the same things will keep happening.” Without some new daily actions and habits, you will not change very much. In this blog post, I want to focus on the process you will need to go through if you want to make a change in your life. I invite you to set an hour aside and take yourself through my questioning process. At the same time, have a notebook and /or some plain paper and pens to hand. First, choose ONE area of your life that is not working at the moment or what you want to improve. This could be related to your health/diet/exercise regime, stress levels, work/life balance/social life. Write it down. What you want to achieve and by when? Set a date and write it down. Then give each of the steps a time/date to be completed by. What daily habits can you create to support your goal? (Remember it takes about 6 weeks to install a new habit.) Do you have any habits now that are not useful to you? Be honest, these old habits may have served their purpose in the past but are they helpful now? If not, make the decision to change them. “You will never change your life until you change something you do daily. Karen is an Eating Psychology Coach. She is the creator of the Conscious Eating Programme: Changing your thoughts about food to transform your body and your life. Find out more about Karen's work here. ​I was intrigued to watch a documentary on BBC1 last week called The Doctor Who Gave Up Drugs. Dr. Chris van Tulleken, an Infection Control and Scientist specialising in antibiotic resistant drugs sat in on a GP’s surgery in an attempt to persuade both GP and patients not to have any prescription drugs. He was in for a hard time because almost every patient wanted some sort of prescription. The whole point of Dr. Tulleken’s approach is that his research shows that by 2050 10 million people every year will die because we have become resistant to antibiotic drugs due to overuse. Not only is this a problem but also the extensive side effects of prescription drugs which contribute to illness and sometimes death. In the medical profession, this is known as iatrogenesis. One male patient complained of a sore throat and requested antibiotics. Luckily he was persuaded to leave without a prescription and told that his body would heal itself over time. Another female patient took up his challenge to give up her numerous pain killers she was taking for her shoulder pain. It transpired that she had not done any of the recommended exercises. Later in the programme we see the same woman shocked to find that Dr. Tulleken had given her placebo painkillers, which led to her deciding to come off the drugs herself. We also see her doing regular strength exercises on her shoulder which led to more fluid movements and less pain. Antidepressant drugs were also another problem highlighted as they are taken by over 5 million people in the UK annually. One young lady in the programme reported that she’d been diagnosed with depression when she was 16 and had been on these drugs ever since. Now, at the age of 24 she wants to give them up because she feels they just mask her symptoms and are not getting to the root of her problems. The programme advised us that between 2006 and 2012, the prescribing of antidepressants to young people had gone up more than 50% which Dr. Tulleken found quite alarming. Antidepressants work on the neurotransmitters in the brain which affect mood. In the programme, by means of an alternative to the drugs, he got her to swim in cold water which scientists have found stimulates the stress response to provide an euphoric, positive mood. I’m not sure I would want to swim in cold water just to stimulate my mood! As a regular walker, I think a far easier way is to go walking in nature. The Chief Medical Officer in the UK recommends 150 minutes of physical activity per week and many scientific studies have been carried out comparing the benefits of outdoors activity as opposed to indoors. They show that walking in nature gives far more benefits, both physiologically and psychologically. Psychologically, there is increased vitalisation, improved mental clarity, improved mood, increased self-concept, improved sleep and reduction in stress levels. And it’s all free with no side effects! One GP in the programme highlighted the fact that 99.9% doctors prescribe drugs because they are “appropriate” prescriptions for the conditions and that doctors feel under pressure to prescribe these pills. I would argue that doctors feel that each and every one of their prescriptions are “appropriate” because they are not trained to prescribe any alternative. They have little or no training in nutrition or nutritional medicine, little to no training in exercise physiology, and no training in complementary therapies, such as massage. The medical profession has a tight grip on our health but it doesn’t have to be that way. Instead of handing over our minds and bodies to them, there’s a lot we can do for ourselves. I have spent many years working with people who need to exercise on GP referral exercise schemes and I recommend taking regular exercise, eating real food and meditating daily to keep yourself in optimum health. For further information please contact Karen, The Conscious Eater on 07804 529371. E J is a therapist and counsellor with Holistic London, specialising in relationships, emotional difficulties, and discovering life purpose. For information about his work, visit here. 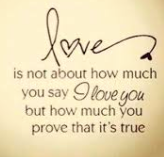 Based on romantic movies, we might think that love’s greatest expression is in those words, “I love you…”, a statement meant to assert both the present and the future, for time immemorial. From being in relationships, however, or perhaps in and out, as is often the case, we soon learn that words are not enough; it is one thing to pledge dedication to another, and it is quite another to show up for them, day after day, in way that shows that we really care. Certainly, parents across the globe struggle with this distinction. Their love for their children may be without limits, but their patience and ability to cope with a child’s every need may be another thing all together! And then, we must also look at our relationship with our own self. In my previous blog, I discussed the surprisingly difficult challenge, posed by the book, The Mirror Work, of looking in my own eyes and stating love for myself, pure and simple. But, with time, my ability, and perhaps my honesty, with doing this grew, to the degree that my statement does not come out as a quavering question, but rather as an affirmation of what I already feel is true. Once again, however, a statement to an image in a mirror is one thing. But what does it truly mean to have a loving relationship with one’s self, day after day? At first thought, that question left me a bit clueless; I just didn't know. But in contemplating it, I realised that a parent’s best relationship with a child is perhaps our ideal reference for how we can learn to more deeply and effectively love ourself. In all relationships, love is not just something we feel or proclaim; it is a consideration that decides how we behave. Love means that we will treat the other with the greatest thoughtfulness and care that we can, especially in those moments when it is not convenient or easy. It means doing those things that will help the person truly feel healthy and good in themselves, no matter what. In the coming week, start to pay attention to how you are treating yourself, and ask yourself, “Is this the way a loving parent would treat their beloved child?” If not, change that behaviour! Remember, “Love” is an action verb, and it all starts with ourself. ​For one of the books for summer reading, my attention was caught by the recent book by Louise Hay, celebrated author of a number of books about healing, and founder of Hay House, a top holistic publisher. Louise’s most recent book is “Mirror Work”, and she reports the message has been essential for her success and wellbeing. So, of course, I was intrigued. The focus of her book is simple but essential: In the end, the thing that matters most is how much we actually love ourselves. As the old saying reminds us, we come into the world alone, and leave it alone. How we are with our own selves is bottom line. The point is unavoidable. Sure, it is wonderful and important to love our spouse or partner; to love our children; to love parents and extended families, communities, country, fellow humans. And to love God. But if we have love for all of these, and yet do not love ourselves, what is it all worth? It’s interesting to note, occasionally a book about loving ourselves comes to my attention, and yet, in ratio with all of the other books in the stores, these are quite rare. Lots of books on attracting a mate, but little on how we are with ourselves. How interesting, a focus on loving ourselves is either not interesting or is just not considered commercially viable! Simple, but for many, perhaps seemingly impossible or unacceptable. For myself, I tried this first thing in the morning, looking into my pair of tired eyes, and had trouble getting out the words. It seemed so unnatural, and I was not sure I believed it. But, good news, Louise’s book is a 21 Day Program, so we get more than a second chance. So, on Day 2, I returned to the bathroom mirror, looked squarely in my own eyes, and repeated the statement. That I really do love myself. Whether our culture says is ok or not. Whether I want to believe it or not, that is how it is going to be. And interestingly enough, by around Day 4 or 5, I noticed a shift. I found myself a bit more resolute, a bit more solid about saying it. And a lot more willing to shift my focus to the seat of my own true power. There I was, meeting myself in the mirror each morning. I am not yet through the 21 Day program, but have started to recommend this book to friends and clients. And so, I offer it to you, for your consideration. To me, it represents our first and final destination. Why Are We STILL Getting Fatter? Until recently, most public health research has focused on fat as the source of making us fat. However, there is now evidence showing that this is not true. For the past 40 years or so, we have been advised to reduce our fat consumption. We were told fat raises cholesterol, gives us heart disease and makes us fat. As a result, food companies replaced the fat with sugar. We now know that the science was wrong as many studies have shown that it’s not fat that’s the culprit, it’s sugar! We now know that sugar and transfats are the problem, although not all fats are created equal. There are good and bad fats. Highly recommended fats are nuts/seeds, nut butters, good quality extra virgin olive oil, coconut oil, grass fed butter, wild fish, MCT oil, grass fed meat and avocadoes. In Mark Hymen’s new book ‘Eat Fat, Get Thin’ he cites 53 studies published showing it’s the high fat diets that actually result in weight loss. This has led to a lot of confusion as there are so many “diets” on the market, so how can we know if this is true? One thing we do know for sure is we’re all terrified of fat and so many are hooked on sugar! The million dollar question is “how can we even start to move away from sugar and towards fat? It is recommended by Mark Hymen, that we do a sugar detox. He suggests that we remove sugar and have a 50% fat intake. The results, he promises, will be substantial weight loss, blood sugar and cholesterol will normalise, insulin will be lower. In his research he has found that when you eat fat your metabolism speeds up, you feel less hungry, and you burn fat. Conversely, when you eat sugar, the metabolism slows down, you feel hungrier and end up craving more food, or certain foods, then the body stores more fat. Another great book to help you move away from sugar is The Sugar Detox Plan by Drs. Mosetter, Simon, Probost and Caveliuss, where they take you through a 3-step plan for breaking your sugar habit. Once you have managed to successfully detox from sugar, another highly recommended read is The Alkaline Cure by Dr. Stephan Domenig. As with all good books, it’s great written down on paper, but how do you put it into practice? What do you do when you “fall off the wagon?! !” If you need coaching and one-to-one support I offer a free 30 minute Transform Your Relationship With Food consultation. Please call Karen, Eating Psychology Coach at The Conscious Eater on 07804 529371. Take Charge of Your Space! E.J. is a certified feng shui consultant and educator. He specializes in transforming the quality of life by shifting the energy in homes and offices. For more about these feng shui services, visit here. ​Many years ago, before studying feng shui, I was having dinner at an Ethiopian restaurant and as my date and I were choosing a table, I mentioned I wanted to sit it against the wall so I could face the entrance. She didn't seem to mind, and the man next to us said he felt the same way and that he often asked to face the door. We decided it must be a “man thing”, with references to mobsters who never sat with their backs to the entrance. Years later, I learned I was referring to what, in feng shui, is called the Command Position. It is always preferable to sit and sleep where you can see the door, so you can feel in charge of the space. Now, when I have dinner with feng shui colleagues, I have to fight for this position! In my apartment in New York (also before feng shui), I had first situated my desk against the wall, with my back to the door. And guess what? I never used the desk. Once, I forced myself to sit there for a few hours to pay some bills, but I never went back. 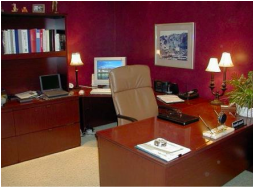 However, once I learned the practical wisdom of feng shui, I placed my desk in the command position, facing into the room, with a solid wall behind me, so I could see the door and even the television, if I wanted. And from that time forward, I sat there most of the time when I was at home. When writing my book, I spent 6 to 10 hours a day at the desk, and being in the command position made me feel comfortable and energised. If your desk, favourite chair, dining table, and bed are already in the command position, you probably feel pretty comfortable and in charge of your life. But, if not, you have some rearranging to do. This week, see how you can put yourself in your best position for taking charge of your space, and your life. Michele is a Life Coach with Holistic London. For more information about her work, check her out here. I joined in with the International Day of Happiness (20.03.2016) by going onto the website where I found lots of information on how to get involved, and increase my levels of happiness....why not, more is always good. The dictionary defines happiness as a feeling of pleasure, carefree wellbeing, felicitousness.... if that’s a word. However these are not words that I would only use to define happiness, if asked by an alien. For me happiness always starts with a feeling within the body, and then it is expressed externally by gestures and action then by language. We can see and even feel someone’s happiness, even if they never tell us verbally that they are feeling happy. For these feelings to be lasting and re-creatable, they must come from within ourselves. If only external things make us feel happy, then when we move away from those things or triggers, and they are removed from our lives we then experience difficulty in being happy. Yes, I admit this is a very simplistic overview. Dr. Lyubomirsky’s research, states that we have the ability to make ourselves happier permanently. This research has been confirmed by others, and states that we each have our own genetic set point which is responsible about 50% of our happiness, life circumstances about 10%, and a massive 40% is up to you baby! The 40% you create depends on your habits and attitudes to life. Think of one thing at the start and end of the day that I am grateful for. Find time to enjoy my hobbies and what they give to me. Make time to be with my family and friends, sometimes it’s a phone call but being able to connect those I care about makes me feel good. Dance around the house to music that I enjoy listening too. Sing my favourite happiness songs are..... Bobby McFerrin's “Don't Worry, Be Happy and Pharrell Williams hit “Happy”. with offices in London and Zurich. For more about these services, visit here. ​The sun is shining in London as I type this, a breeze gently rocking my houseboat. There’s a spring in people’s step as they go about the marina. Showers and hailstorms notwithstanding, Spring has finally Sprung, bringing with it the exciting—or dread!—prospect of Spring Cleaning. I personally enjoy de-cluttering. Some of my friends and clients, however, find it a challenge, some even an insuperable ordeal. Certain issues tend to recur, for which a mix of practical strategies and EFT tapping can hugely help. Issue: Feeling overwhelmed. There’s too much stuff to deal with: a backlog of clothes / books / papers / tools / electronics / kitchen gadgets / bathroom bits / suitcases / mystery cables / old National Geographic magazines / photographs / toys / other people’s stuff / heaven knows what! Strategy: Chunk the task down. “I will deal with just socks,” you might say to yourself. Or shoes. Or books. Breaking the task down into smaller categories makes it instantly more manageable. Once you’ve dealt with one category, proceed to the next. Issue: Feeling you shouldn’t donate things that were a gift and/or have a sentimental association. Strategy: Read Marie Kondo’s The Life-Changing Magic of Tidying and embrace her thoroughly refreshing philosophy. A gift has served its purpose, for example, when given, received, and appreciated. After that it can be guiltlessly released! *If you still feel unsure, put the item in a “limbo” box, keep it for a few months, then re-evaluate.